Because we are about to have a baby girl any day now, I thought this was a perfect book to pick up for my husband to read. This review is from his perspective. 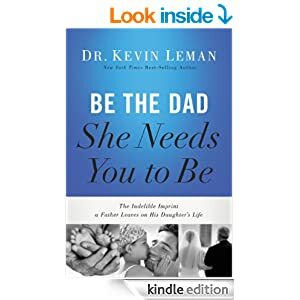 Be the Dad She Needs You to Be by Dr. Kevin Leman describes many specific situations where simply being present isn’t enough. You have to know your daughter(s) in ways that you never thought necessary, and this can be difficult for men because men don’t always naturally think like women. One of the greatest examples given is in regards to the drama that girls tend to gravitate toward; he emphasizes the importance of keeping your cool and listening, because sometimes that is all she needs you to do. I loved the number of suggestions and personal examples that he gives throughout the book, and especially the stories from other people about how his teachings have worked well with raising their daughters. I think it will help me be a better father in the sense that I can be very selfish, as we all can, and I might not naturally think of a lot of things that my daughter is going to need. This book was very blunt and clear about how to discipline, set boundaries, etc. Ultimately, this book reminded me that a daughter needs a dad who is very involved, and that can be the very thing that sets her up for success in this world.